Although Chabad has a global reach, each local Chabad center is run as an independent entity, supported solely by its local community for the benefits it brings everyone. 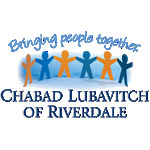 Chabad Lubavitch of Riverdale is a 501(c)3 non-profit organization and gratefully accepts tax deductible contributions. Chabad Lubavitch of Riverdale’s federal ID number is 13-3697594. This is one of the most efficient ways to pay and you will receive a tax receipt by mail. You can pay by Visa, masterCard or American Express. It’s secure, fast and easy and reduces Chabad’s administration costs. Call our office at 718-549-1100 ext. 10 and speak directly with our office assistant, who will process your payment immediately. You can send us manual credit card information or checks made out to Chabad of Riverdale. There is no tax on the capital gain of publicly traded securities if they are donated to a public charity. The normal taxable portion of the capital gain when securities are sold is 50%. A receipt is issued based on the market value of the transferred securities on the day Chabad Lubavitch of Riverdale receives them in our account. However, the amount credited to the donor will be based on the proceeds realized from the sale of securities, less selling commission. Establish your personal and permanent legacy to help ensure the strength and vibrancy of the future of Chabad of Riverdale. See our Donate a Car page. We accept gifts of computers and office equipment. Please call 718-549-1100 ext. 10 or email Library@ChabadRiverdale.org to discuss details. Donations can be made by credit card either in a lump sum or in installments (monthly, bi-weekly, etc.) This is an extremely efficient method of payment for people who do not wish to receive paper or e-billings. Disclaimer: This information is not intended as legal advice. For legal advice, please consult an attorney or financial consultant. References to estate and income tax include federal taxes only; individual state taxes vary and may have further impact on results.